I enjoyed looking at this quilt. It made me think about being a kid again. 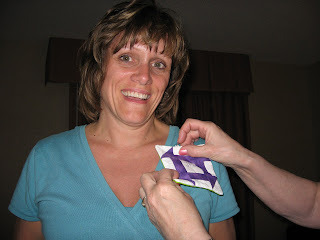 For those Chat Room gals, here's JPo (aka Debbie) receiving a new Purple Churn Dash pin that I made her. 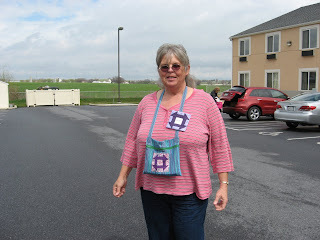 The next day Nancy arrived at Jennie's Diner in her truck and was given a purse made by HMM (Helen Marie) and a PCD pin made by me. And then it was off to the races...or should I say off to the shops and the show. Shop til you drop is a phrase that have to have first been said by quilters. 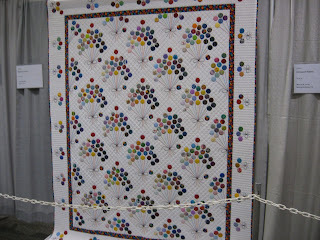 I'll post more pictures of the quilts and people later. It's time for another nap. Its fun to see chat friends...even if you ARE far away! Yes it is, and even better to meet them.